Ranking as one of the most beautiful cities in China, Hangzhou is a place where inspiration thrives and ancient culture intertwines with the present day. The breathtaking imagery of the city is reason alone enough to visit. 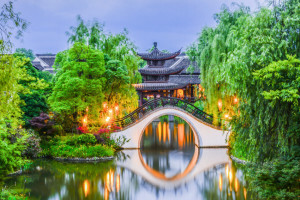 Thanks to Stunning China, the supplier sponsor of this article, you will not miss your chance to see the many gardens and temples of Hangzhou. Hangzhou stands as both the capital and the most populous city in the Zhejiang Province of east China. Sitting at the head of Hangzhou Bay, the city has been one of the most prosperous cities in China for quite some time. Although the city has developed to reflect a more urbanized setting and culture, there is still much of its ancient charm. 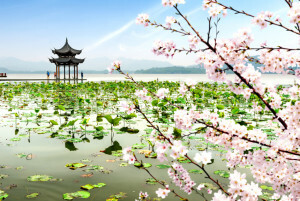 One of the most popular sites in Hangzhou is West Lake. Named a UNESCO World Heritage Site the area is scattered with gardens and pagodas as well as temples. Many artists have been inspired by the beauty of West Lake, and it is even one of the main inspirations of Chinese garden designers in both the past and present. Seeing the Ten Scenes of West Lake are definitely worth a stroll through the area. Known as the most scenic spots of West Lake, these ten areas are each marked by a four character epithet written on a stele. Within West Lake you can explore an array of different temples celebrating different leaders and figures from different periods of time, like the Yue Fei Temple. Built in honor of Yue Fei, a general of the Southern Song dynasty who fought during the Jin-Song wars, this temple also contains a loyalty temple as well as Yue Fei’s mausoleum. With construction dating back to the 12th century, much of the tombs and tomb scriptures have been restored with great care and attention to detail. The Lingyin Temple, a Chan-sect Buddhist temple, is also found in West Lake. As one of the largest and wealthiest Buddhist temples in China, it is worth viewing when visiting Hangzhou. Walk through The Hall of Heavenly Kings, the formal temple entrance, and marvel at the statutes of the four heavenly kings. 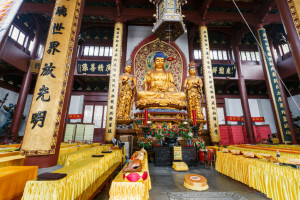 Make sure not to leave the Lingyin Temple without gazing upon the Hall of Five Hundred Arhats. This courtyard contains five hundred bronze statues of arhats, each on their own unique seat, surrounding a bronze canopy containing the four Bodhisattvas that represent the four cardinal directions. This canopy is currently the largest solid bronze structure in the world! The West Lake Museum is one of many museums found in Hangzhou; it has four main exhibitions that focus on how West Lake has influenced design and culture through time. The China National Tea Museum is another interesting museum to visit when vacationing in Hangzhou. On display are different kinds of tea, and the process of tea production. The Zhejiang Provincial Museum is home to over 100,000 pieces detailing and exploring ancient Chinese history and culture. It is a great way to get to know more about Hangzhou through different forms of art including pottery, painting, and calligraphy! The China National Silk Museum is another one of the interesting and educational museums found in Hangzhou that offer a great way to spend time. Here you can learn the history of silk in China, see beautiful pieces of clothing made by some of the most prominent weavers and producers, and even participate in the process of weaving silk! Not only do you get to learn about the process, but being able to actually partake in it makes the knowledge even more exciting. Spending time outdoors when in Hangzhou is one of the greatest ways to take in the city, and one of the more popular outdoor areas is The Hangzhou Botanical Garden. One thing that is rather unique about the Hangzhou Botanical Garden is that it is divided into two areas: a pleasure section and a research section. The research garden is where the cultivation of plants is studied, and often attracts academics and people interested in the act of planting and gardening. Due to its sheer size, the pleasure section of the garden is separated into multiple smaller gardens based on the different types of plant life. Take a walk through the bamboo garden, where stalks of bamboo can grow as tall as three stories! Or, browse the Botany Appreciation Garden where you can see over 5,000 plum trees standing upright. If you are visiting during the winter you are in for a treat, as you will be able to see these plum trees stretch all the way up. Although much of Hangzhou’s culture and beauty are found in its outside spaces, there is ample shopping throughout the city as well. Yan’an Road is a commercial district area full of shops and buildings. Along the road you will see many different brand name stores as well as shopping malls and plazas that sell a range of goods. Peruse souvenir shops for embroidered silks and umbrellas. Or, browse one of the many vendor booths found along the road. The dining in Hangzhou is another way to get to experience the culture found around you, just through food! Make sure to grab a meal at Hyatt 28, which has been named one of Asia’s top 50 restaurants more than once. Here you can experience traditional Hang dishes. The English-style restaurant Mr. King Restaurant and Lounge is a great option, for not only does it serve a wide range of Asian and Western food, but during the afternoon it is open for English tea, scones, and cakes. It also has a lovely drink menu, and is a great place to stop for a night cap after a long day of seeing the sights of Hangzhou. A visit to Hangzhou on your Chinese vacation is one you will not regret, and thanks to Stunning China you will have no problem securing the opportunity to see the beauty of the city!